All of these books will be released the week of May 17, 2011. Now Maylene is dead and Bek must go back to the place—and the man—she left a decade ago. But what she soon discovers is that Maylene was murdered and that there was good reason for her odd traditions. It turns out that in placid Claysville, the worlds of the living and the dead are dangerously connected. Beneath the town lies a shadowy, lawless land ruled by the enigmatic Charles, aka Mr. D—a place from which the dead will return if their graves are not properly minded. Only the Graveminder, a Barrow woman, and the current Undertaker, Byron, can set things to right once the dead begin to walk. The morbidly monotonous Dullsville has finally become the most exciting place on earth now that Raven is madly in love with her hot vampire boyfriend Alexander, and a crew of vampires has taken residence in Dullsville's old mill. Raven discovers Jagger's plan to open a new club, The Crypt, right here in Dullsville. But is it her dream come true, or her worst nightmare? Raven and Alexander have to figure out what the nefarious vampire has in store for Dullsville's teen and vampire population. Can Raven convince Jagger to listen to her plans to make the Crypt the morbidly magnificent dance club it could be? Will it be safe for mortals and vampires alike? And as Sebastian and Luna's relationship heats up, Raven wonders about her own amorous fate: Will Alexander ever turn her? Does he crave her and does he want to spend eternity together? And what does she really want? With cryptic secrets and cravings, this eighth installment in the Vampire Kisses series is a romantic and mysterious thrill ride. “Sleep well, and stay where I put you.” If that's not a hook, I don't know what is. This one sounds very interesting. Here's my WOW for this week. 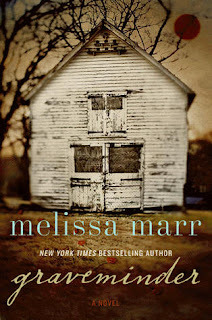 A new Melissa Marr! How exciting! Yay, I'm so excited about Melissa's new book! I can't wait to see her take on adult books - this sounds so refreshing and interesting! And I still haven't read The Vampire Kisses series... But it's on my TBR list. And I really like this cover! Didn't know Melissa Marr had another book coming out. Sounds good! Both these books look amazing. I'm interested in the first one by Melissa Marr. Here's my WOW Happy reading! Great picks!! I'm really looking forward to reading both! The Graveminder looks awesome! Happy Reading! Here's my WoW! Wicked excited about Graveminder! Hope you enjoy it as much as I plan to! Check out what I'm waiting for! Two books I have been waiting for! Great picks! Dark Days of Supernatural Tour - Chicago Stop!